With the increasing demands for higher capacity, more diversity and more personalization of services, the capacity and versatility of access networks needs to be expanded. In recent years, more and more equipment manufacturers and network operators have turned their focus on the optical network access technologies. FTTH (Fiber to the home) networks are becoming the trend of future access networks. Passive optical network (PON), as a major technology of FTTH, offers point-to-multipoint (P2MP) network access with lower installation and maintenance costs. 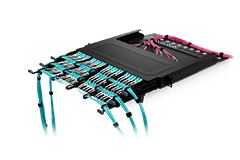 EPON (Ethernet Passive Optical Network) and GPON (Gigabit Passive Optical Network) are popular versions of PONs at present. They are both competitive and complementary with their own advantages. This tutorial is mainly on the comparison of them at different aspects. PON, namely passive optical network, has been available since the mid-1990s. A PON system generally consists of an optical line terminal (OLT) at the service provider's central office and a number of optical network units (ONUs) near end users. 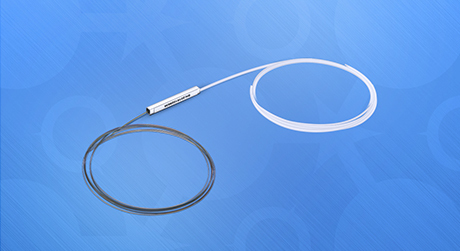 In addition, optical splitters are used to enable a single optical fiber to serve multiple premises. Significant development activities occurred during the early 2000s to develop Gigabit rate solutions designed to deliver Ethernet and IP services. Two very different solutions were developed by the IEEE and ITU-T—EPON and GPON, respectively. While the general concepts (PON operation, ODN framework, wavelength plan, and application) are the same for both EPON and GPON, their operation is very different, as are the features and services supported by each. EPON is a native Ethernet solution that leverages the features, compatibility and performance of the Ethernet protocol, while GPON leverages the techniques of SONET/SDH and Generic Framing Protocol (GFP) to transport Ethernet. GPON, or gigabit-capable PON, uses an IP-based protocol and either ATM or GEM (GPON encapsulation method) encoding. Data rates of up to 2.5 Gbps are specified and it is very flexible in what types of traffic it carries. GPON enables "triple play" (voice-data-video) and is the basis of most planned FTTP (Fiber to the Premises) applications in the near future. EPON or Ethernet PON is based on the IEEE standard for Ethernet in the First Mile. It uses packet-based transmission at 1 Gbps with 10 Gbps under discussion. EPON is widely deployed in Asia. The system architecture is the same as GPON but data protocols are differenet. 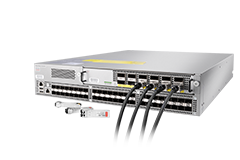 EPON uses standard 802.3 Ethernet data frames: IEEE 802.3 standard, ratified as 802.3ah-2004 for 1.25 Gbps (1.0 Gbps prior to 8B/10B coding) and IEEE 802.3av standard for 10Gbps (10G-EPON). The upstream and downstream data rate of EPON is symmetrical. GPON supports various bit rate options using the same protocol, including a symmetrical data rate of 622 Mbps in both downstream and upstream, a symmetrical data rate of 1.25 Gbps in both streams, as well as a data rate of 2.5 Gbps in downstream and a data rate of 1.25 Gbps in upstream. 2.5 Gbps of downstream bandwidth and 1.25 Gbps of upstream bandwidth are the data rates supported by typical GPON systems. Thus, we can decide the upstream and downstream data rate depending on the requirements, and then choose the corresponding optical transceiver modules. It is more flexible than EPON. Conclusion: GPON is better than EPON in this round. Split Ratios means the number of users intended to be served by a given PON. This is typically engineered to be 32, but can also be 16, 64, or even 128. In EPON, the standard generally supports a minimum of 32 (i.e. 1:32). Actually, EPON does not limit the split ratio. That means, 1:64, 1:128 are also available in EPON. Provides can define the split ratio according to the services and bandwidth they want to support. In contrast, GPON defines an upper limit on split ratio. It is promised that GPON is support 128 and typical split ratio is 64. There are several common split ratios of GPON – 1:32, 1:64, or 1:128. GPON offers the multiplicity of split ratios, but not much advantage on the cost consideration. EPON can deploy cheaper optics at the ONU as it does not need to reach a split ratio of 128. However, the split ratio is far more influenced by the performance of the optical transceiver modules. A big split ratio will substantially increase the cost of optical transceiver modules. Furthermore, a big split ratio will lower the transmission distance. Too many users share the bandwidth is also the cost of a big split ratio. When the split ratio is 1:16, the maxium transmitting distance can reach 20 km. And 1:32, the maximum transmitting distance is 10 km. EPON and GPON is the same on this aspect. Particularly 10Gbps, everything almost the same, namely they provide the same bandwidth to the same number of subscribers. Conclusion: EPON and GPON neck and neck in this round. layering model and the associated management. 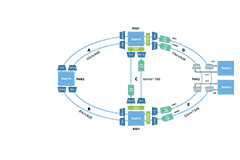 Services are all mapped over Ethernet (directly or via IP). In order to accomplish the same in GPON, two layers of encapsulation are required. First, TDM and Ethernet frames are wrapped into GTC Encapsulation Method (GEM) frames, which have a GFP-like format (derived from Generic Frame Procedure ITU G.7401). Secondly, ATM and GEM frames are both encapsulated into GTC frames that are finally transported over the PON. As the Figure 2 shown. 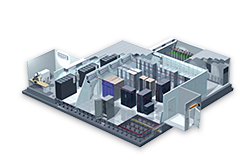 The main purpose of the GEM frame is to provide a frame-oriented service, as an alternative to ATM, in order to efficiently accommodate Ethernet and TDM frames. Both ATM and GEM modes are mandatory at the OLT, but an ONT can be configured to support either one, or both. However, when compared to the simple EPON model, it becomes clear that the GEM/GTC encapsulation and inclusion of ATM are adding unnecessary complexity to solve the same problem. 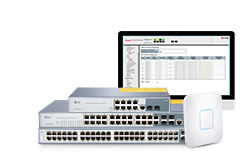 EPON clearly offers a much simpler and more straightforward solution than GPON. The support of ATM and the double encapsulation of GPON serve no real benefit over a pure Ethernet transport scheme. 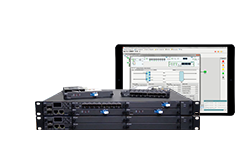 To access service, EPON is only appropriate for data-only services and GPON for triple-play. 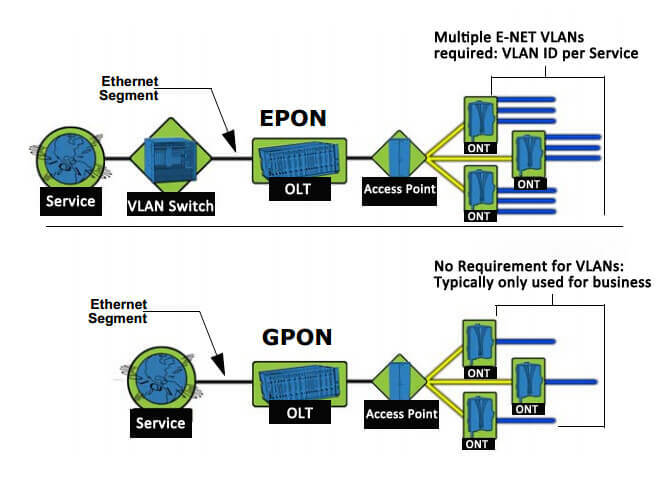 EPON is a native Ethernet solution that leverages the features, compatibility and performance of the Ethernet protocol, while GPON leverages the techniques of SONET/ SDH and Generic Framing Protocol (GFP) to transport Ethernet. Conclusion: For layering comparison, EPON is better than GPON. For service, GPON is better than EPON. In GPON there are three different types of control messages: OMCI (ONT Managementand Control Interface), OAM, and PLOAM (Physical Layer OAM). Their roles are shown in the table below. On the contrary, EPON do not take too much consideration on OAM. EPON utilizes IEEE 802.3ah OAM messages for provisioning, fault isolation and performance monitoring in conjunction with SNMP (Simple Network Management Protocol) sets and gets through IETF (Internet Engineering Task Force) MIBs (Management Information Bases). Additional control messages are MPCP GATEs/REPORTs for Bandwidth granting. The cost of GPON or EPON deployment is depended on the cost of the OLT, ONU/ONT and passive optical components. 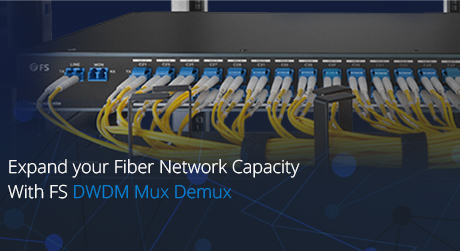 An ODN consists of fiber cable, cabinet, optical splitter, connector, and etc. For the same number of users, the cost for the fiber and cabinet with EPON is similar to that with GPON. The cost of OLT and ONT is decided by the ASIC (Application Specific Integrated Circuit) and optical transceiver modules. The GPON chipsets available in the market are mostly based on FPGA (Field Programmable Gate Array), which is more expensive than the EPON MAC (Media Access Control) layer ASIC. There are only several chipset vendors who can provide GPON chipsets, and it is not likely that the price of GPON equipment can decline rapidly. 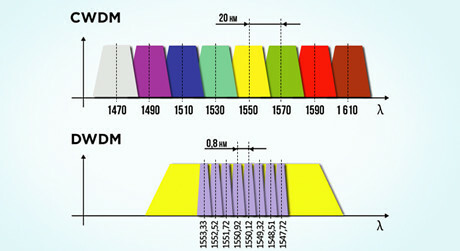 The optical module of GPON is also more expensive than EPON. 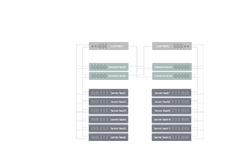 When GPON reaches deployment stage, the estimated cost of a GPON OLT is 1.5 to 2 times higher than an EPON OLT, and the estimated cost of a GPON ONT will be 1.2 to 1.5 times higher than an EPON ONT. Conclusion: EPON is much cost-effective than GPON as the cost of GPON is still expensive at present. According to the contents above, we can see that there are own advantages and disadvantages of EPON and GPON. In performance comparison, GPON is better than EPON, while EPON has much advantages on time and cost. And now, EPON is still the mainstream of PON, and meanwhile, GPON is catching up with it. Going forward to the broadband access market, maybe it is not substitution between EPON and GPON. It is more likely that they are co-exist to complement each other. For the users who have demands of multi-service, high QoS and security, as well as ATM backbone network, GPON seems to be an ideal. 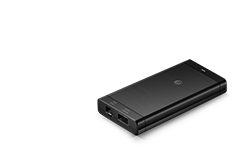 And for the one who is much care about the cost and has less security requirements, EPON may be better.